Best For: Students and other first-time credit users who want an easy-to-use, no-fee cash back card. If you’re in the market for your first credit card, the Journey® Student Rewards from Capital One® is a solid choice. Two highlights of this card are no annual fee and no foreign transaction fees. And with two benefits – cash back percentages and higher credit limits – based on timely bill payment, you’ll have the incentive to pay your balance on-time each month. This could help a new user establish good credit habits. The card has a 26.96% Variable APR for purchases and balance transfers. The low credit limit, starting for most at $300, can help keep a new card user in check. Every purchase will earn you 1% cash back with no limit to how much cash back you earn. If you pay your statement by the due date, you’ll receive a bonus 0.25% in cash back. There are no bonuses for purchases in special categories, which keeps things simple with this more basic starter card. However, if you do spend a lot on certain categories of purchases such as gas or groceries, you might prefer a card that gives you a higher percentage cash back on those purchases. But if you’re looking for a basic first credit card with simple benefits, the Journey® Student Rewards from Capital One® is a concrete choice. Capital One also offers unlimited access to CreditWise®, a free mobile and desktop app. CreditWise® offers credit score monitoring which includes email alerts if your TransUnion® credit report changes. Another feature of the app is a simulator that allows you to see potential credit decision impacts. You can compare how your credit score would change with decisions such as increasing a credit card limit or paying off credit card debt. No annual fee – You’ll have one less worry with no annual charges for the Journey® Student Rewards from Capital One®. No foreign transaction fees – Purchases during vacations, study abroad and other out-of-country trips have no foreign transaction fees. 1% cash back – As a cardholder you’ll earn unlimited 1% cash back on all your purchases, with potential to bump to 1.25% with on-time bill payment. Unlimited access to CreditWise® - This app includes tools to help you monitor your credit score and profile. Consumers looking for a solid starter credit card will appreciate the Journey® Student Rewards from Capital One®. The low starting purchase limit ($300) may keep high spenders away, but it’s a benefit for those just starting to gain familiarity with credit cards. No annual fee and no foreign transaction fees keep things simple and easy with the Journey® Student Rewards from Capital One®. With a flat 1% - 1.25% cash back, there are no special offers to keep track of such as double points for restaurants, gas or travel. If you frequently make purchases in those categories and would like maximize points, you may need to consider a different card. But, if you want to keep things simple and earn unlimited rewards, this flat-rate card is a good choice. This card is not your best option if you’re planning on transferring a balance from a different card. While the Journey® Student Rewards from Capital One® does not include balance transfer fees, you'll still have to pay a 26.96% Variable APR on the balance. With other cards offering 0% introductory APR sometimes up to 15 months or more, the Journey® Student Rewards from Capital One® doesn’t compare. The Journey® Student Rewards from Capital One® has no annual fee, and a 26.96% Variable APR. With each purchase you charge, you'll earn unlimited cash back rewards at a rate of 1%. As a bonus incentive, if you pay your bill on time, you’ll earn another 0.25% in cash back. The points never expire, and you’ll only lose them if you close the account prior to redemption. While the minimum credit limit is $300, you can access a higher credit line after making your first five monthly payments by the due date. There are no balance transfer fees and the APR stays the same for both purchases and transfers. This card doesn’t offer an introductory rate. You start with 26.96% Variable APR from day one of owning the card. For cash advances, you’ll be charged $10 or 3% of the cash advance, whichever amount is greater. Capital One offers Visa Platinum Benefits with its Journey® Student Rewards from Capital One®. These benefits include 24-hour travel assistance services, an extended warranty, auto rental insurance and travel accident insurance. Paired with the perk of no foreign transaction fees, this card keeps your travel options open. As a card aimed at students, this card has limited signing perks. You won’t find an enticing intro APR or cash back bonuses for spending a certain amount in the first few months – which isn’t necessarily a bad thing. The point of this Capital One offering is for slow credit growth with low spending limits. You’ll still earn points and save yourself from foreign transaction fees with the Journey® Student Rewards from Capital One®. You just won’t earn the thousands of points some cards offer with purchases over $1,000 in the first few months – that’s just not the point of this card. For those looking to max out rewards, get travel perks and transfer credit balances, you’ll likely want to find a different card that offers more incentives with higher credit lines. Whichever card you choose, make sure it’s the right choice for you and your financial and spending goals. The Journey® Student Rewards from Capital One® keeps it simple and gives you an unlimited 1% cash back on all purchases. With no cap on your rewards, you can earn as much cash back from purchases as possible. Additionally, if you pay on time, you’re rewarded with an extra 0.25% cash back. As long as you pay your bill before your account becomes past due, the extra points will post to your rewards balance within two billing cycles. One thing to keep in mind is that some Capital One accounts are eligible to transfer rewards, but not all. If this is something you’d like to do, you’ll first have to verify that your rewards accounts include the correct permissions. 26.96% and can vary with the market based on the Prime Rate. The APR for cash advances is the same for purchases: 26.96% Variable. Your due date is at least 25 days after the close of each billing period. If you pay your entire balance by each month’s due date, you will not accrue interest charges. If you’re in the market for your first credit card but want to maximize reward points, there are better options for you to choose from. The Discover it® Student chrome card offers a $20 statement credit for GPAs higher than 3.0 for up to five years, and a first year cash back match. Commuters and students living off-campus can benefit from the bonus categories. You’ll earn double (2%) cash back at gas stations and restaurants on up to $1,000 each quarter. Similar to the Journey® Student Rewards from Capital One®, there’s no annual or foreign transaction fees for this card. However, unlike the Journey® Student Rewards from Capital One®, if you’re late on your first chrome card payment, you won’t be charged a late fee. Citi also offers the ThankYou® Preferred Card for College Students that features 2,500 bonus points (equivalent to $25 cash) if you spend $500 within the first three months. If you frequently go out, you’d be a good match for the card. You’ll earn double points for dining purchases and entertainment – all with no annual fee. There are foreign transaction fees associated with this card, so if you’re planning on using the card for travel, it’s something to keep in mind. Another card with similar bonus point offerings is the Bank of America® Cash Rewards credit card for Students. With a $200 cash bonus for spending at least $500 in purchases in the first 90 days of opening your account, this card beats Citi’s ThankYou® Preferred Card for College Students bonus of $25 for the same spend. If you’re more of a home cook than restaurant goer, you’ll stand to benefit from this card’s bonus categories. You earn 1% cash back for every purchase, 2% for grocery store and wholesale clubs and 3% for gas purchases for the first $2,500 in combined grocery/wholesale club/gas purchases spent each quarter. There’s no annual fee, but there is a 3% foreign transaction fee. 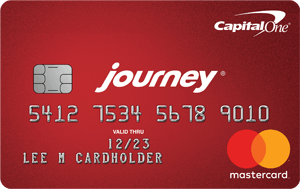 The Journey® Student Rewards from Capital One® is a great option for a first card to help build your credit. It offers simple, easy-to-remember features that benefit the user. Cash back is a flat 1% per purchase, and the APR stays the same between purchases, balance transfers and cash advances. Additionally, with no annual fee, unlimited rewards and no foreign transaction fees, this card has the potential to be a college student mainstay. The only drawbacks are a low credit limit and lack of balance transfer intro APRs, which make this card less attractive for those with more established credit and larger purchase needs. But if you’re a college student interested in building a credit history with a user friendly, simple card - this may be just the one for you.